Sharvan and Baghwan Nath, bhopas from Alwar. 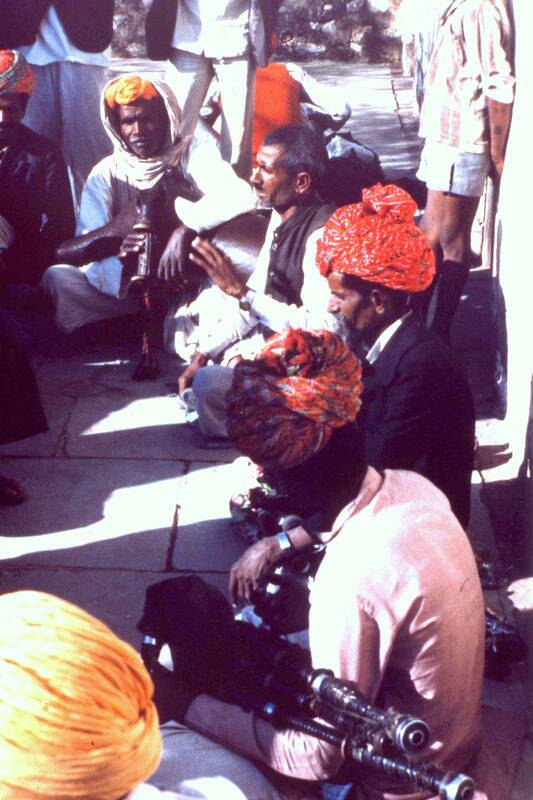 In January 1986 I undertook fieldwork in several regions of India. It was partly funded by the Indian Council for Cultural Relations and arranged by the Inter University Circuit for Indian Classical Music. 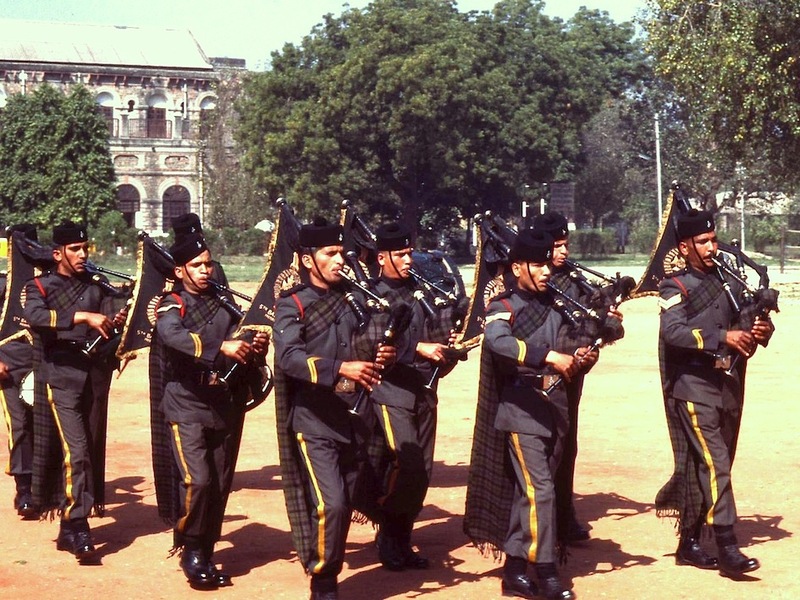 The funded part was spent visiting teaching institutions and meeting with some of India’s finest classical musicians. 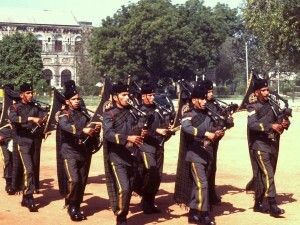 I then stayed on another two months in India, for I was interested in researching the use of the bagpipe there: this included the Scottish Highland bagpipe, which over two centuries was diffusing throughout the sub-continent and which was played in many Indian army, police and school bands as well as by itinerant musicians. Dhani Ram, priest at Jageshwar temple. After Delhi my research took me to the foothills of the Himalayas (Almora district). 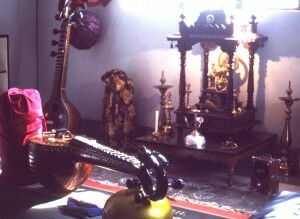 In the sample below Dhani Ram plays a song in Chabeli rhythm, accompanied by Kurwar Ram Das on a horuka drum. They were both bhopas at the 3000 year-old temple of Jageswar near Nainital. 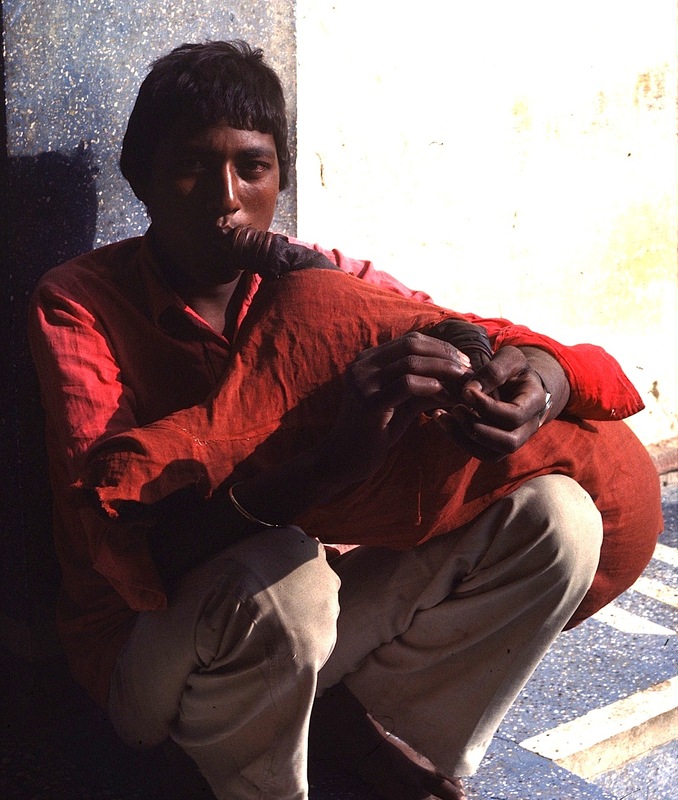 These pipes were given to Dhani Ram in 1925 when he was 18 years old by an British doctor, locally called Asis Maharaj, who worked at the Mithola ashram. 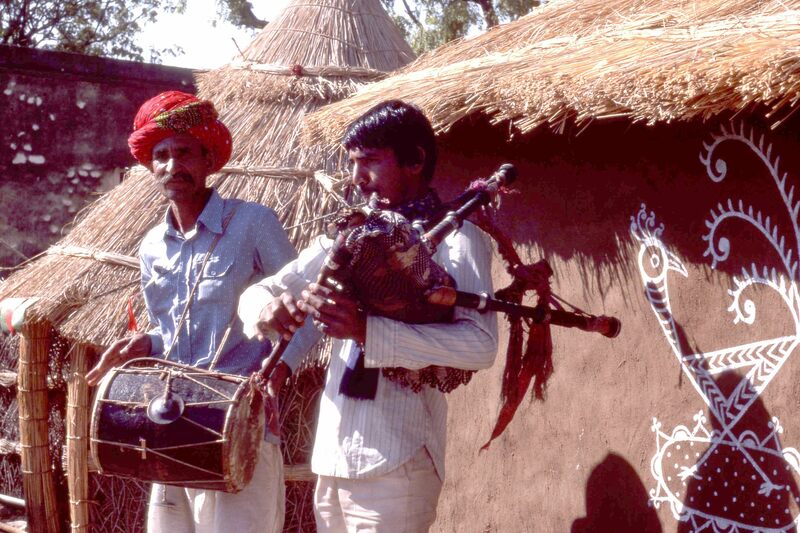 In Rajasthan I had arranged to work with Komal Kothari, the late Director of the Rajasthan Folk Music Insitute, for I also intended to research the indigenous bagpipes which had received rare mention in the scholarly press but were still in use. We first met at a camp at Dungargarh in the Rajasthan desert where Komal had assembled a small team of musicians for the filming of a folk drama. At Toliyasar temple we met and recorded father and son, Leda and Adu Ram (of the Nayak clan), bhopas of the God Bherav. 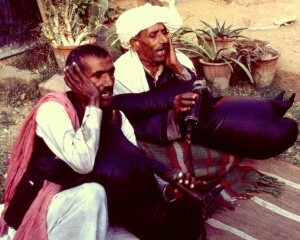 They used their bagpipes (masaq, mashaq or bin baja) at a variety of rituals. Here Adu sings the beginning of a song for a night-wake ceremony: unlike his father’s double-chanter instrument, his had a rudimentary single-bore chanter, hence no drone is sounding. 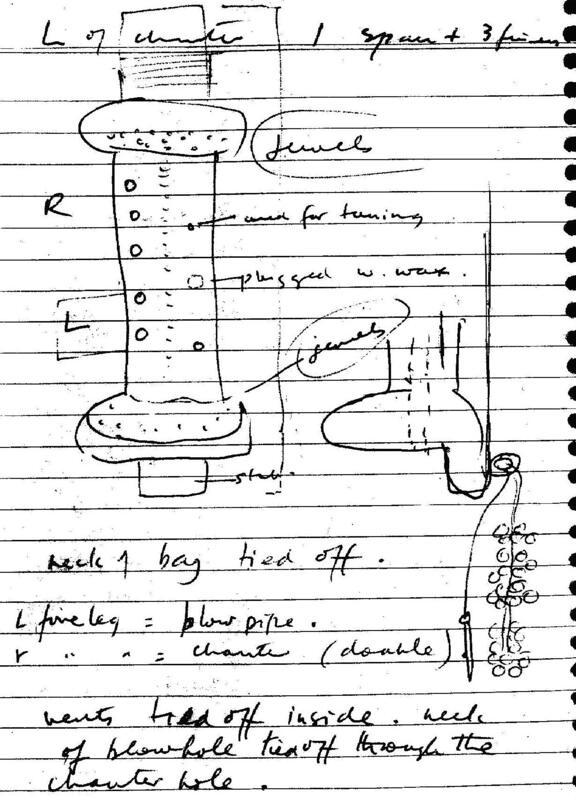 Apart from ‘apprentice’ Adu the other bhopas used short double chanters as in this sketch from my field notes. We returned to Komal’s home in Jodhpur. Komal had arranged for musicians to visit us and we enjoyed many hours discussing and recording music. 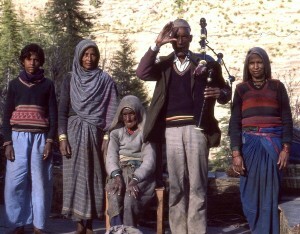 This included performances of long epic tales by bhopa musicians who sang to their own bagpipe accompaniment. Ajud Kangar at Tilonia. His ‘Scottish’ bagpipe has no bass drone. As well as exploring a variety of other instrumental playing styles and repertories (eg. sarangi, pungi, satara and narh) performed by some of Rajasthan’s finest musicians I was invited to travel with the musicians to a performing arts festival in Tilonia. There, over the weekend, I was also able to work with itinerant musicians playing the Scottish pipes. The 46 tapes, recorded using a Stellavox recorder and Sennheiser microphones, were copied for archiving at the Indian Archives and Research Centre for Ethnomusicology before I left India. 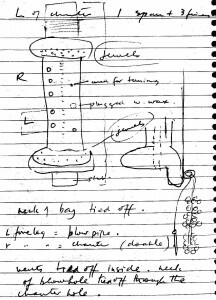 They are also lodged in the archives of Edinburgh University’s School of Celtic and Scottish Studies. Click here for my working index of recordings: Indiaex.